Dr. Frankenstein and his infamous monster would love this mobile home. The creator of this monster inspired mobile home took great care to combine Hollywood glam with a touch of goth and just enough horror movie inspired decor to create this gorgeous home. We absolutely love this monster inspired mobile home decor! 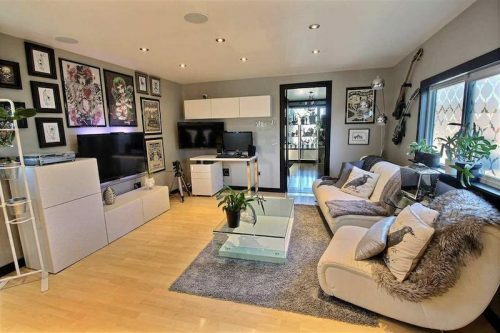 The living room puts the owner’s unique art on full display. 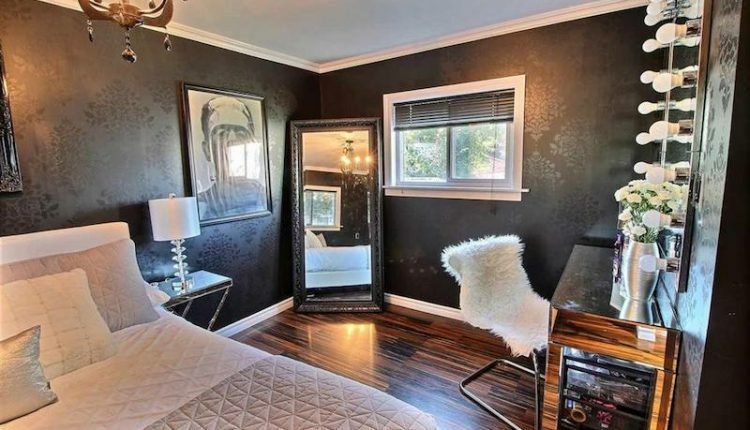 There are so many different home decorating styles, this one could be described as Hollywood glam and monster goth. The frosted design on the windows allow natural light to brighten the room while still keeping a bit of privacy. 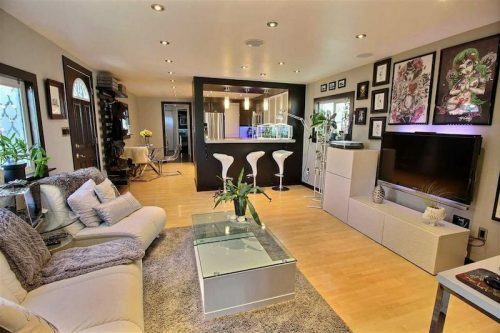 Clean lines and frosted glass windows make this monster living room stand out! The dark breakfast bar divides the living room and kitchen just enough to make the space feel separate while still keeping to an open floor plan. 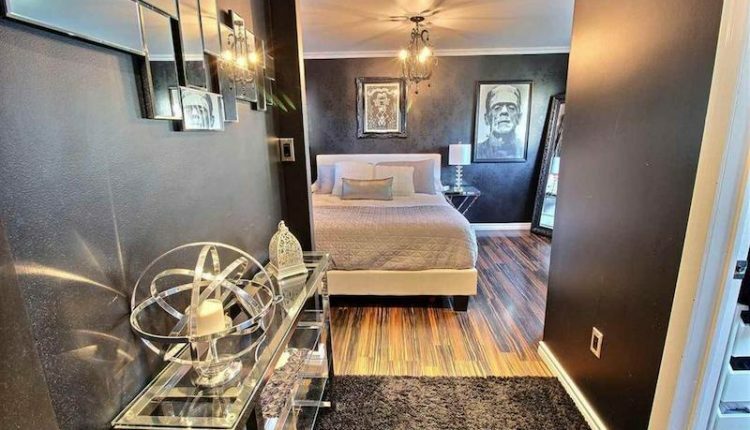 This monster inspired mobile home is perfect for a Hollywood glam fan. 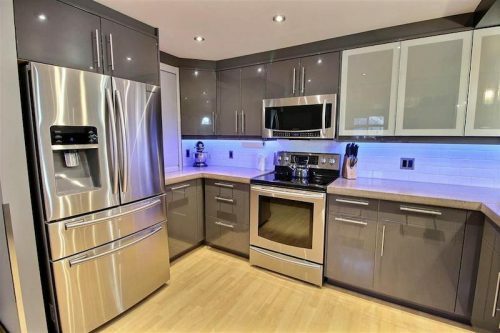 This gorgeous kitchen has custom made concrete countertops and very cool built-in fiber optic LED lighting. 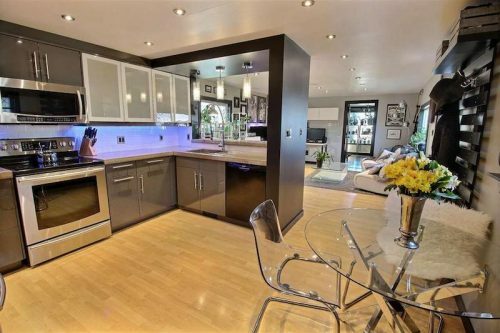 This kitchen is a perfect example of the sleek modern designs that have been gaining popularity. It’s definitely minimal but the dark cabinetry gives it warmth. Love the lighting in this space! The front entryway storage shelf is perfect. The bedroom is a real treat for all you Hollywood glam and horror movie fans! We’ve been told that you shouldn’t use dark wall colors in small rooms but that simply isn’t true. This master bedroom has a perfect combination of dark, white, and mirrored surfaces that bounce light around. 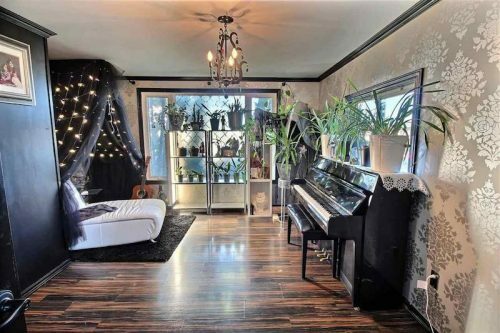 The master bedroom in this monster inspired mobile home is magnificent! Dark walls combined with plenty of white and mirrored surfaces create a stunningly warm space. The second bedroom takes the Hollywood glam theme to the next level. Elaborate chandelier lighting, satin wall coverings, and black accents come together like a Mozart masterpiece in this makeshift music room. This music room can inspire a masterpiece! Of course, the bathroom in this monster inspired mobile home is going to be awesome. 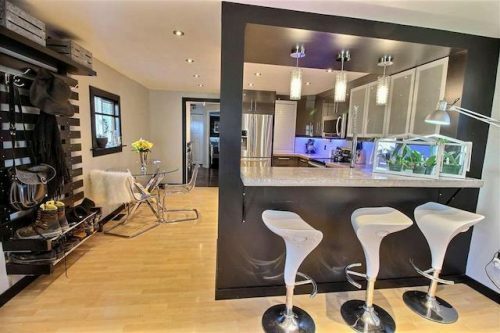 It has all the modern favorites: subway tile, sleek cabinetry and faux deer heads painted white on the walls. 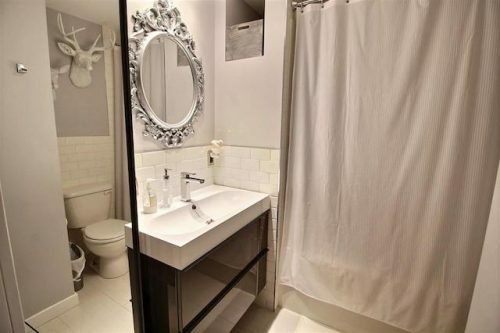 The all-white bathroom is gorgeous! 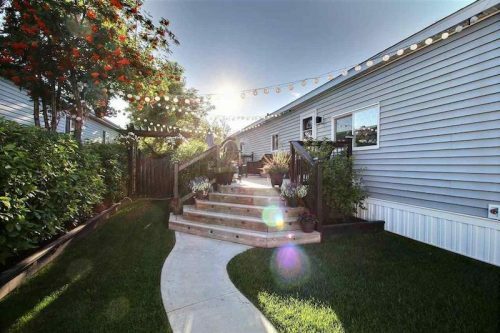 Related: Check out another gorgeous manufactured home that is an interior design masterpiece! Yep, I could maybe like doing laundry in this space. Maybe. 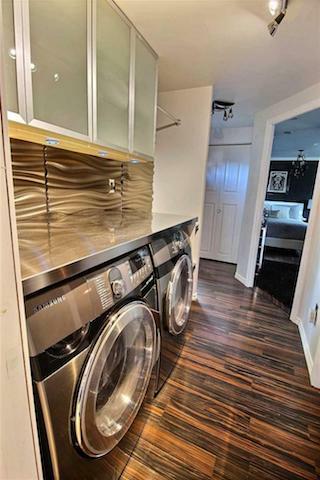 Laundry could actually be fun in this sleek laundry room! This monster inspired mobile home, located in Edmonton, Alberta Canada, was built in 1977 though you’d never know it. The owners have done an amazing job remodeling and updating it. If the person that designed the interior isn’t a professional interior decorator they need to be. Go ahead and have the business cards printed! We found this amazing monster inspired mobile home on a Canadian real estate listing site. You can live in this luxury for less than $100,000! You can see this monster inspired mobile home listing here. The home is a 980 square foot, 2 bedrooms and 1 bath home and the asking price is $95,900. We are not affiliated with the site and we didn’t try to contact the realtor though we really should have just to see if the owner is a professional interior designer. I need to know! 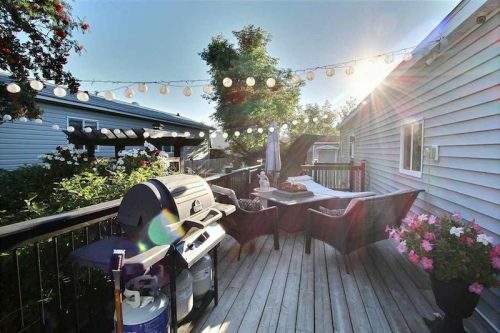 Related: There are some beautiful Canadian Mobile Homes on the market. You can see more here! Have you seen a beautiful home that you think we should feature? Comment below or send us an email. We love sharing beautiful mobile and manufactured homes!